The crew of Lancaster Bomber ME814 took part in a major air raid in mid July 1944. It involved more than two hundred aircraft and was designed to cause chaos behind enemy lines, hundreds of miles from the Normandy Battlefield. Author, broadcaster and former RAF Navigator John Nichol explains what happened to the crew of ME814. 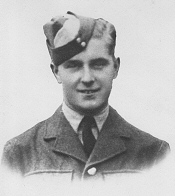 20 year old Pilot Officer Jesse Dallen, 19 year old Flight Engineer Sergeant William Shaw, 20 year old Air Gunner Sergeant Frances Smith, 25 year old Air Gunner Sergeant Douglas Wensley, 23 year old Navigator Albert John Williamson, and Sergeant Bertie Woodward, the Wireless Operator, who was 32. 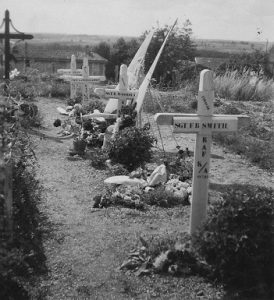 Here is an early photograph of their graves. 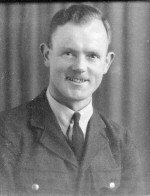 Here is a photograph of Sergeant Bertie Woodward. … here is Sergeant Frances Smith. Soon the names of the crew of Lancaster ME814 will be added to the British Normandy Memorial to honour their bravery and sacrifice on their final mission together.The Normandy Memorial Trust is building the British Normandy Memorial.